Sam Adams’ 500th appearance for Hastings United Football Club ended in a victory this afternoon (Saturday). The Hastings captain led his team to a 3-1 win at home to Whitstable Town which strengthened Hastings’ hold on second place in the Bostik League South East Division. 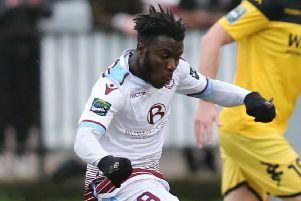 Once the game got underway, goals from Youssouf Bamba, Sam Beale and Daniel Ajakaiye gave Hastings a seventh home league win out of seven this season. Hastings enjoyed a lot of the ball and played some good football during the first half, but they had to wait until the 44th minute before opening the scoring. Bamba did brilliantly to control a deep cross from the right by Ajakaiye and step inside Whitstable defender Stuart West before driving a low shot past goalkeeper Dan Eason for his fifth goal in six games. Ajakaiye had failed to convert two good chances prior to that. He firstly came from nowhere to dispossess Tom Bryant and was in on goal only to shoot just wide. Shortly afterwards he missed the target when it seemed easier to score after Eason was unable to hold Jack Dixon’s sweetly-struck shot from the edge of the area. Bamba caused plenty of problems on the home left and on one occasion he skinned West before seeing his cut-back poked just wide of his own post by Whitstable player John Walker. Dixon was stroking the ball around beautifully in the Hastings midfield and his sublime defence-splitting pass led to Hastings’ second goal in the 49th minute. Beale made a great run from left-back to get on the end of it before coolly rolling the ball into the bottom corner for his first goal of the season. Whitstable pulled one back with their first noteworthy attempt of the game just two minutes later. A free kick from the away left dropped to Bryant, who drove the ball home left-footed from inside the six-yard box. The visitors seemed to grow in confidence after the goal and all of a sudden things weren’t so comfortable for Hastings, particularly from the fine set-piece deliveries of Harry Brown. Kyran Connolly played a splendid ball through to fellow substitute Elliott Hartnell-Baker, whose shot was parried by Hastings goalkeeper Charlie Horlock and gathered at the second attempt. Seconds later at the other end, Bamba’s angled shot was pushed out by Eason. Adams then had an opportunity to mark his big day with a goal only to blaze over from 15 yards after a Lanre Azeez shot deflected out to him. Hastings were grateful to Beale for clearing Stephen Smith’s header off the line after Brown’s deep free kick from the Whitstable right was nodded back across goal. Brown then struck a low shot which went whiskers wide of the post and Charlie Smith fired just over from outside the box as Whitstable enjoyed their best spell of a bright but chilly afternoon. Hastings swiftly killed the game off with their third goal in the 77th minute. Ajakaiye intercepted an under-hit back pass from Bryant and rounded Eason before rolling home his 22nd goal of the campaign. Hastings, who gave a first team debut to academy product Charlie Curran as a late substitute, were comfortable thereafter. The vast majority of their second biggest home crowd of the season hoped that Adams could crown his 500th game by dispatching an added time free kick into the top corner, but instead his effort cleared the crossbar. Hastings: Horlock; Mensah (Fielding HT), Howlett-Mundle, Cruttwell, Beale; Ibrahim, Dixon, Adams; Azeez (Curran 88), Ajakaiye, Bamba (Walker 83). Subs not used: Lovatt, Taylor. Attendance: 512.